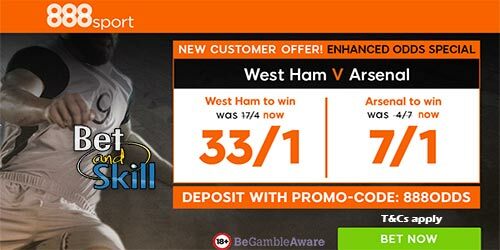 Get 33/1 West Ham to win or 7/1 Arsenal to win at 888sport! Max bet £5! West Ham host Arsenal at London Stadium on Wednesday night. Wanna place a bet on this clash? 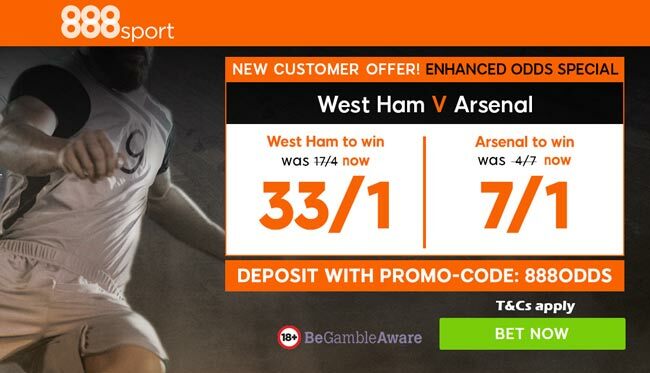 888sport are offering enhanced odds - West Ham to win @ 33/1 or Arsenal to win @ 7/1! Max bet £5! West Ham appear to have turned a corner after defeating Chelsea 1-0 last weekend. That win was a first in five matches for David Moyes, just their third league win of the season and a first since the end of September. Join 888sport and claim enhanced odds on either team - 33/1 West Ham or 7/1 Arsenal to win the match! "Get 33/1 West Ham to win or 7/1 Arsenal to win at 888sport! Max bet £5!"